The image above was discovered by the author on the Facebook page of Rangers pitcher and cross-cultural ambassador of handsome Yu Darvish. What is not at issue here is just how much time the author has been spending on Yu Darvish’s Facebook page, or to what end. What is at issue is just what the above image, which was captioned only in Japanese, might have been intended to depict, reflect, or connote. For this, reader, I earnestly solicit your help. We hoped you liked reading Caption Contest: Mini-Yu by Mississippi Matt Smith! 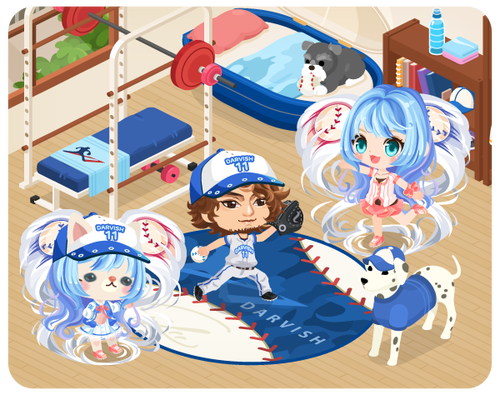 Yu Darvish advocates playing ball in the house, with an actual baseball, and while your friends are a girl, an anthropomorphized cat, and a not-anthropomorphized dog, and none of them have gloves. It’s totally safe and won’t damage anything.